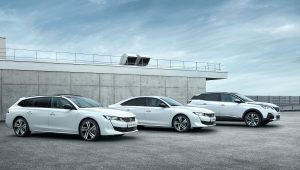 Peugeot is to introduce Plug-in Hybrid petrol engines for the Peugeot 3008 SUV, and the all-new Peugeot 508 and 508 SW, giving an all-electric driving range of up to 30 miles. The HYBRID and HYBRID4 powertrains will feature new driving modes including the ZEV 100% electric mode, 4-wheel drive mode with the HYBRID4, Sport mode, Comfort mode or Hybrid mode. The vehicles can be recharged in less than 2 hours by using a Wallbox (6.6 kW 32A). The all-new Peugeot 508 HYBRID and 508 SW HYBRID bring together the PureTech 180hp/132kW engine with a 110hp/80kW electric motor for a combined maximum power of 225hp/165kW with less than 49g/km CO2. The Peugeot 3008 SUV is being equipped with the powerful HYBRID4 system. This provides 4-wheel drive with multi-link rear suspension equipped with a 110hp/80kW inverter and produces the equivalent of 300hp/220kW. This is the result of the combination of a PureTech engine developing 200hp/147kW and two electric motors (one at the front and the second at the rear) each developing 110hp/80kW, resulting in 0 to 62mph in 6.5 seconds. The battery capacity is 13.2kWh for a 100% electric range of 30 miles based on the new WLTP test. The PureTech engine is combined with the new e-EAT8 8-speed automatic transmission (Electric Efficient Automatic Transmission – 8 speeds), specific to Peugeot Plug-in Hybrid engines. An electric motor is linked to the box and reaches 110hp/80kW on the front suspension. The HYBRID4 engine is only available in GT trim. A few months after its launch, the HYBRID4 version will be joined in the range by a HYBRID version of 225hp (165kW).